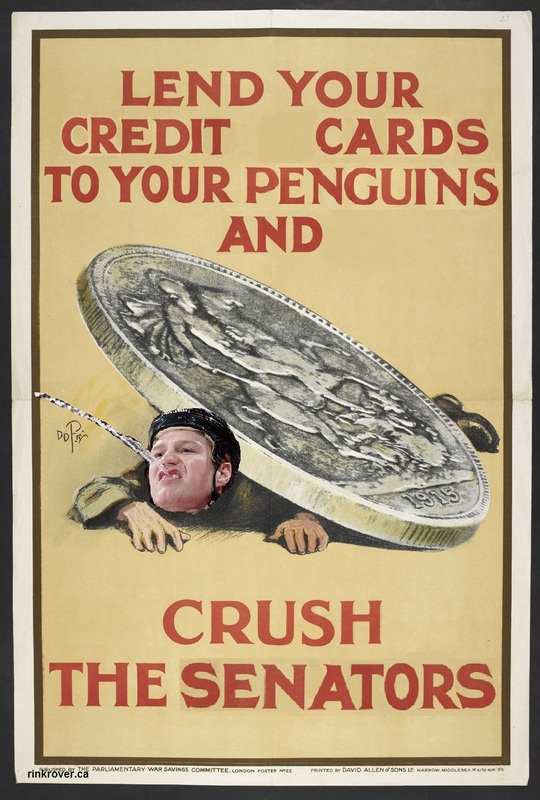 In the pursuit of balanced but ridiculous coverage of the Sens-Pens series, I've prepared some posters to motivate the Penguins and their fans (especially after the demoralizing experience of seeing those pro-Sens posters yesterday). 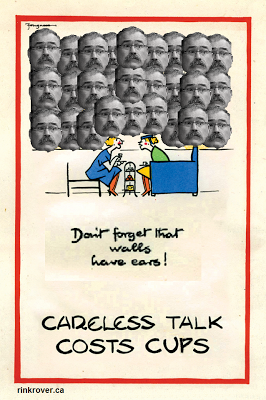 This may be the last poster blog for a while as I may go permanently cross-eyed from staring at MS Paint files for extended periods of time (especially while erasing almost as many swastikas as I did when receiving textbooks at the start of each semester in high school). Here are six ways in which the Pens might use posters to pump up their team and its fan base. Building on the ridiculous yearly narrative that is journalistic discussion of which team is "Canada's team" (spoiler alert: I'm voting for the Pens as they have the scorers of the "golden goal" on the team"), I thought it's time for America to embrace one team as their own. Never mind that the faceless Canadian menace that is about to stomp on New York is probably stepping off from Sidney Crosby's native Nova Scotia: the Pens are unquestionably America's team because sports! This poster has the added benefit of cultivating imaginings of the Rangers' homeland getting trampled. Sure, the Pens will rally around the Rangers and their sometimes-used alternate logo of the Statue of Liberty but not before their divisional rival has first been thoroughly trounced. 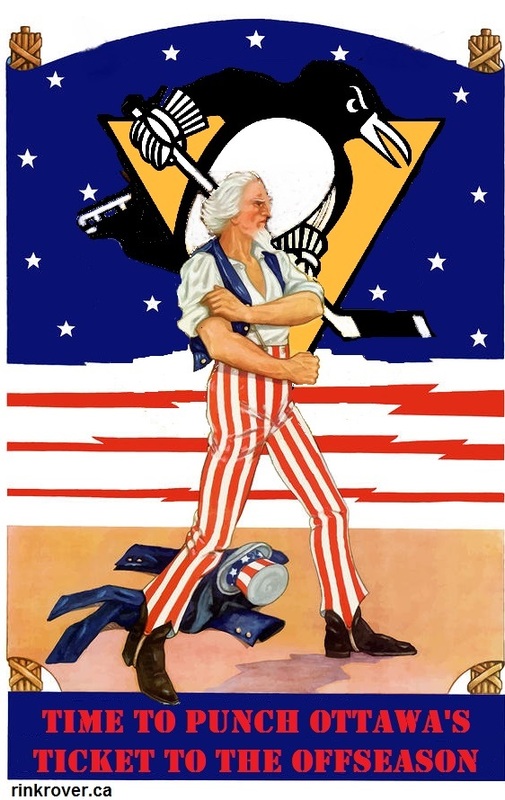 One possible danger surrounding this poster is that if its message is taken too far, the US Senate might reopen its committee on un-American activities and detain much of Pittsburgh's roster with trials reminiscent of McCarthyism. Once the playoffs have been redefined as a nationalistic crusade against the faceless, city-stomping scourge from Canada, the Penguins can incorporate other nationalistic symbols into their idealizations of the postseason. For instance, no American propaganda-poster series would be complete without an allusion to Uncle Sam. This poster helps to promote hockey in America (perhaps the least popular of the four major-league sports in the States) by equating it with the stars and stripes. I chose this poster over the typical representation of Uncle Sam (i.e. the "I Want You" image) because this depiction of America's national character is through with talking. He's dropped the ridiculous top hat, set aside his jacket with tails, and rolled up his sleeves to do some serious head punching. I wonder why the US (in times of war) doesn't use the angry, thunder-bolt design for the red stripes instead of the orderly and boring straight stripes. In this context, the intimidating red streaks suggest that it's time for Americans to brawl out some old-time hockey. 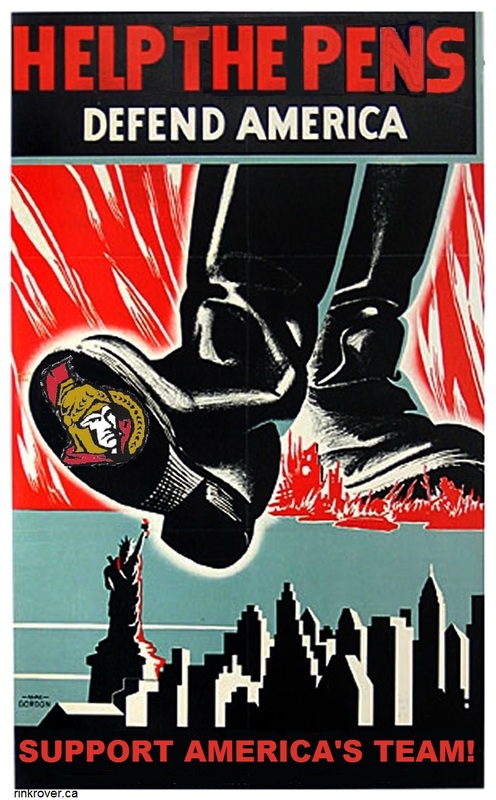 This poster may, however, blow up in everyone's face as the Sens are more than willing to oblige the Pens in fights--an area in which the Sens most certainly will dominate and humiliate the Pens, causing Americans to disown the team. Yesterday I focused on the notion that the Sens are the underdogs in this match up. Today, I'm going to emphasize that the Pens are favoured (sidenote: this post won't be so pro-America that I omit any un-American uses of "u") to win in the second round of the postseason. 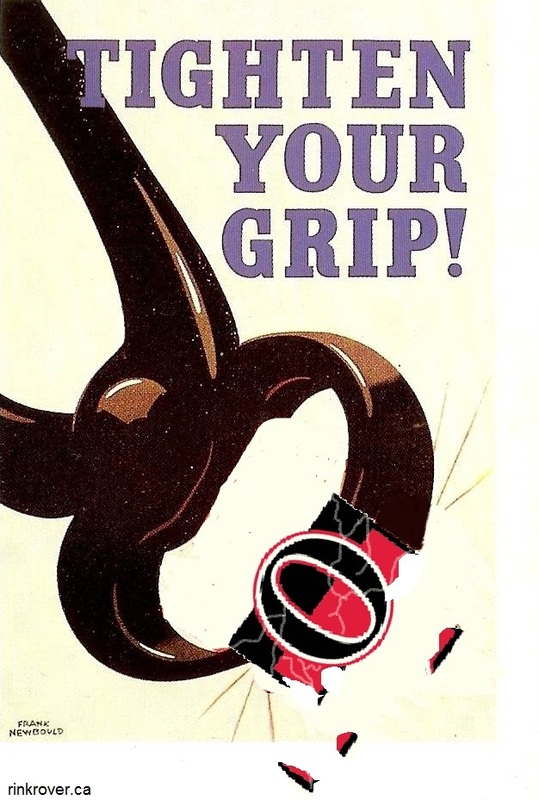 This poster reminds the Pens that they have a solid grasp on the series, and they just need to clamp down and extend that lead to break their opponent. Of course, this poster might backfire as it seems contrary to the conventional playoff wisdom that teams need to avoid gripping the stick too tightly in white-knuckle games. If during tonight's game we see a record number of sticks broken and shots sent miles wide of the net, I'll remove this poster. 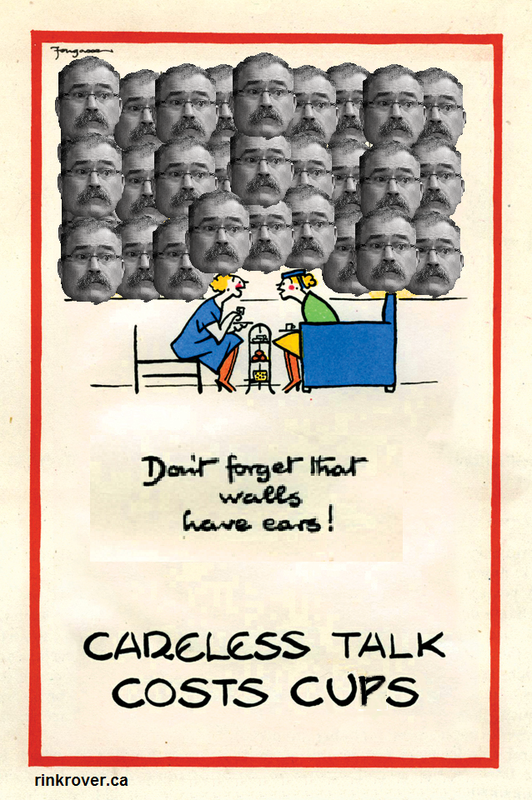 Building on yesterday's theme that careless talk about player injuries might tip off the opposition, I prepared the following (perhaps Orwellian) poster for the Pens and their fans. In the original poster, a minimalist image of Hitler appears all over the walls behind the two chatty women. Apparently during the Second World War, people embraced a form of paranoia that implies that Hitler was omnipresent! Drawing on that theme, I've designed this poster with the menacing faces of Paul MacLean eavesdropping on two hockey wives enjoying a traditional Pennsylvanian tea service and discussing their husbands various vulnerabilities. The downside to this poster is that it might make Crosby's superstitious disposition reach critical mass. If that happens, the Pens captain will probably go into seclusion after seeing MacLean's face everywhere except the safe confines of his home theatre wherein he watches the "golden goal" repeatedly. We'll only hear rumours about the reclusive star as he wastes away clad in Kleenex boxes and whatever he's able to muster in terms of unkempt facial hair. While it seems like a distant memory given the franchise's recent rise in popularity, it wasn't so long ago that the Penguins' future was uncertain on account of financial hardships. Even with a roster more glitzy than a glam metal band's rhinestone Be-Dazzler'd codpieces, there is always danger that Pittsburgh's financial woes will return. 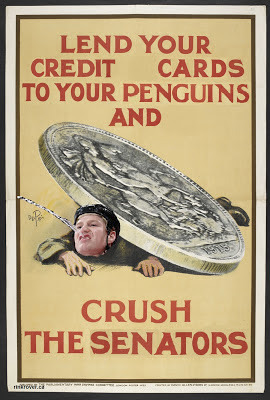 To help ensure that fans don't get disaffected by poor performances in the playoffs (such as last year against the Flyers) or complacent with the team's success, the Penguins organization might consider drafting posters such as this tto encourage fans to partake in the team's triumphs over its enemy. 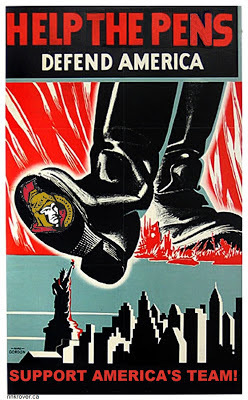 One drawback to this poster is that it might fuel the Sens' aura of indestructibility. They've been crushed by injuries throughout the year and bounced back. Neil's defiance in the poster above seems both fully cognizant of this fact and confident that the Sens will rebound from his loss. Hence the moniker "pesky." In many intractable conflicts, each side resorts to depicting the enemy as an inhuman, vicious monster that has ensnared an emblem of all that is good. These tactics often shore up support for and give meaning to the conflict. Such is the aim of this romantic re-imagining of the Sens-Pens conflict. In this scene reminiscent of Spenser's The Faerie Queene, the Penguins' captain is a knight-errant battling with the serpentine, Sens-headed captor of the cup. 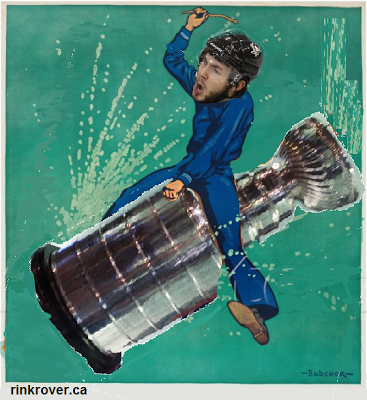 Leafs fans will probably object to this poster suggesting that the Sens once possessed the cup, but such concerns of realism need to be put aside in order to allow my artistic license to drive the point home: the cup will greet the conquering Penguins as liberators. Of course, everything that I've used to describe this poster will work in its disfavour. When facing a tough team like the Sens, it's probably best not to fuel their scorn and feelings of physical superiority by representing your team's leader as a whimsical hero from a romance epic. 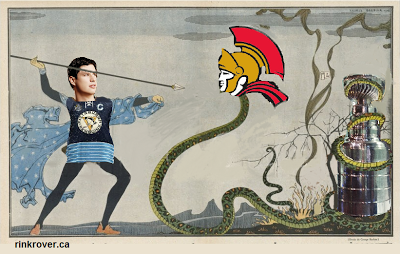 Moreover, the Sens might regard this representation of themselves as a fearsome foe to be complimentary--even if it implies that the first Senator to hoist the cup did so with his invertebrate trunk. Nothing can motivate a team and its fans more than imagining how much fun it is to win. With that in mind, this poster offers a glimpse of how a Penguin such as Kris Letang might spend his day with the Stanley Cup if the team prevails in the playoffs. The only downside here that that cup celebrations hereafter might seem lacklustre compared to the awesomeness of this form of reveling!